Swag Craze: February is National Fresh Breath Month! Rather than getting in a twist about smelly breath before a big date, treat your tongue to a fresh breath fix this February. When it comes to bad breath, experts agree that the tongue can often be the culprit. Sunstar GUM Tongue Cleaner – effectively helps remove plaque and food debris from the surface of the tongue. The two sides provide a dual action - bristles to gently brush and a serrated edge to wipe the surface clean. 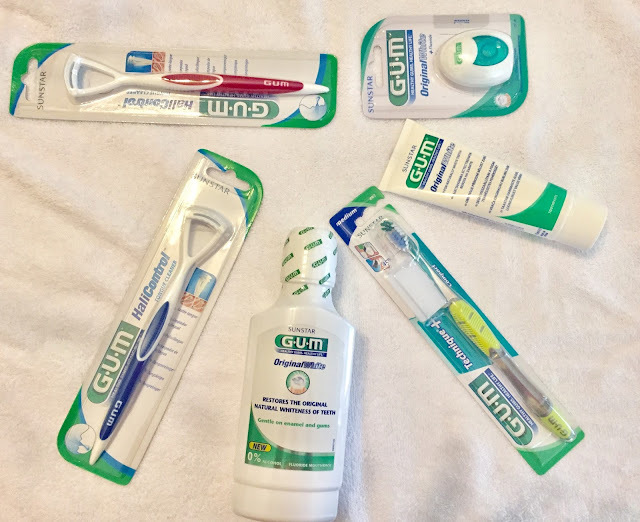 Sunstar GUM Technique+ toothbrush - designed to provide advanced cleaning, even below the gumline. The non-slip quad grips are positioned so that the bristles are effortlessly placed at the 45-degree angle recommended for optimal below-the-gumline cleaning. The Dome Trim® bristles are clinically proven to clean below the gumline reducing plaque, gingival inflammation, and bleeding. The extended SuperTip eliminates plaque from hard to reach places. GUM Original White toothpaste - helps remove stains and prevent their reappearance without damaging enamel. It contains fluoride to reinforce tooth enamel, as well as vitamins for healthier gums. It contains low-abrasive micro-silica to gently remove surface stains and a unique StainClear agent to help dissolve stains in hard-to-reach areas. GUM Original White floss – made with micronized silica to help remove stains between teeth and provides effective interdental plaque control. GUM Original White mouth rinse - alcohol-free Sunstar GUM Original White Rinse contains StainClear to help remove stains from in-between the teeth and the tiny crevices in tooth enamel. Made with a patented combination of fluoride, Isomalt, and vitamins, Original White Rinse delivers advanced mineralisation for stronger and shinier teeth, helping prevent further staining while strengthening gums and teeth. PS: When you sign up for Ivohealth’s newsletter this February they’ll donate a Sunstar GUM toothbrush to the Dental Wellness Trust’s oral health education programme in Khayelitsha, Cape Town. To donate a brush simply sign up on www.ivohealth.co.za/contact-us before 28 February.